If you read this blog regularly, you know that Grant and I have been working on a documentary film of our year of trying to live consumer free and zero waste. Guess what? If you live in Vancouver, please come out and see it on the big screen on Sat, May 29th, 2010 at 7pm at Granville 7 Cinemas! Tickets are available through our online box office (there will also be a few at the door). If you live in the rest of Canada, keep an eye out for us because we’ll be cycling across the country this summer, showing the film along the way. Maybe we’ll be coming to your town? 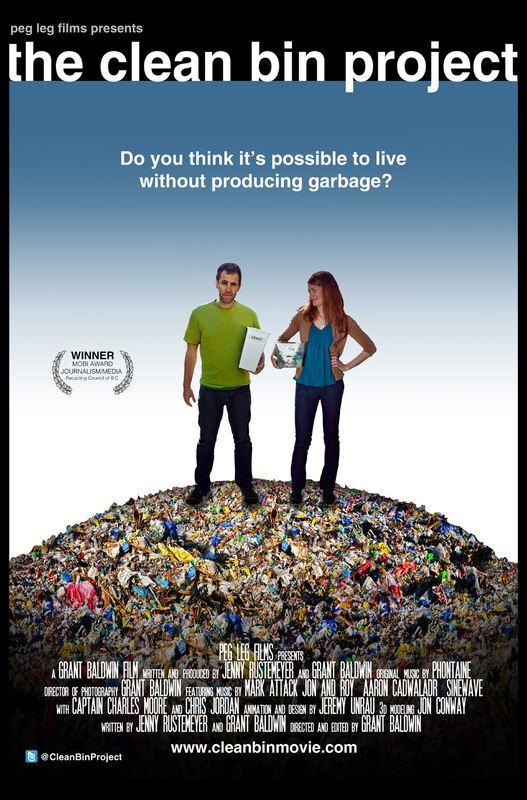 You can watch our progress and see the film schedule at http://www.cleanbinmovie.com/screenings/ (yes, I know it’s not very extensive yet – we’re working on it). Please contact us if your community is on our route and you want to help host a community screening. Looking forward to seeing lots of you this summer! If you live somewhere else in the world, thanks for reading this far. You’re just going to have to sit tight for a bit – we don’t have DVD’s or t-shirts or anything else for sale. But we definitely have bigger plans, and we’ll let you know if the movie gets into a film festival near you. Finally, the blog. Like many of you, I really don’t want this blog to become overrun with film news, so we have set up a separate website for the movie (www.cleanbinmovie.com). Here at the Clean Bin Project Blog, I’ll continue to post every week or so about zero waste and DIY and consumer free stuff just like usual. On the film website, we’ll have a news section where we’ll write about the movie and how the screenings are going and post photos from our tour etc. We are going to share the same old twitter account because I just can’t possibly manage two of everything. Oh Jen! I am SO excited for you! I want you to cycle to the UK and come and show me your film! Congratulations and I can’t wait to see it. Good luck with all the screenings, people are going to LOVE this… And you’re doing so much to spread the message.. I have been following your blog for a year now and can’t wait to see the movie. I live in Berkeley, CA. You have to be able to get a showing around here. Let me know if there is anything I can do to help make that happen. I will be watching for more Vancouver dates, as I will be out of town on the 29th. I will tell my friends to go see it though. Very proud of all of you guys! Whoo hoo! Nice work guys. Can’t wait for Saturday! I can’t wait for it to reach Bristol! Would love to see you in Whitehorse. I will be presenting your documentary to the committee that brings docs to our community. The film series (called Be The Change) runs October-May so unfortunately we won’t be able to benefit from your cycling schedule. I have been following your blog for over a year now and am very much looking forward to seeing your much-anticipated film! Looking forward to seeingthe film in Australia, even if we have to do private viewings! Ooooh, Australia. You’re right, it will likely be private viewings. . . although I would like to go back there. . .